WHOA!!! OVERDUE!!!! If I don't post this up now you're gonna miss the great offer they have for the month of September!!!!! 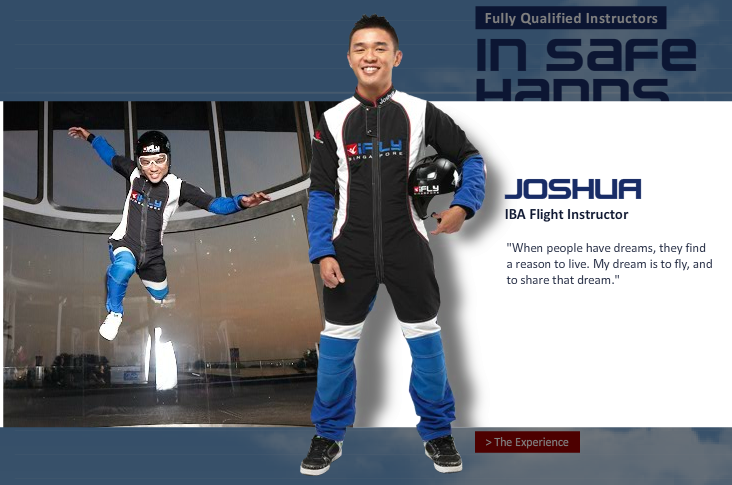 Thanks to iFly Singapore I was invited for an indoor skydiving session (yah can do skydiving INDOORS!!!! Like so cool right!!!!) at iFly Singapore Sentosa!!!!!! If you still haven't heard of it you're not thr first. If I haven't been to Sentosa lately I wouldn't have known that this building here exists just outside Beach Station. You know, that station where you go for Songs of the Sea? Yah, there. WHERE HAVE I BEEN MAN???? And look closely at the sign... there is actually a Check-In area!!! Wah like a real flight! For the noobs (like me), skydiving is actually the same as parachuting. Think about it, you jump off the plane and you skydive, right? And you need to land, yah? Without the parachute you're just going to splat on the floor somewhere. Self-check-in counters!!!!! Wah like at the airport!!! So cool OMG!!!! After you have registered and checked-in, you will have to go through a briefing. This briefing is kinda like a crash course into skydiving, where the instructor will teach you how to position your body during the flight. And because while you are in the wind tunnel, the wind is going to be strong so you won't be able to anything (including instructions) other than the wind ,so you will also be taught how to recognize the hand signals the instructors will be giving you while in-flight. This was our instructor who would be briefing us. His name? Joshua. How I knew? There's this massage-bed-looking thing in the room!!!??? It is here that every single person will have to go up and try the basic flying posture. Yah, cannot run. Every single person who is going to fly will HAVE to do this. They have flight schedules so you know what's happening with each flight (training, gearing up, flying...) and which flights are still availble. One thing so cool about this wind tunnel - it's like being in space, except that you can breathe in there. The instructors brought ALL OF US in (it can apparently house 20 adults in there at one time, though us being beginners, we can only fly one at a time la) to let us have a feel of how it's like. They could control the wind speed from a control room beside the wind tunnel so we could all stand up inside without floating all over the place. Then the youth ambassadors (yeah they have youth ambassadors, and these girls are only 9 years old!) started pouring water from theirw ater bottles into the wind tunnel, AND THE DROPLETS OF WATER FLOATED AROUND, JUST LIKE HOW YOU WOULD SEE IN SPACE OR NASA!!!!!!!!!!! Like, floating beads of water in the air, and you can feel and touch them! Whoa...I want to try this stunt leh!!! Qiu even said she wants to try doing chio poses ala America's Next Top Model style. You'll go into this area where you will see this. Exclusively for flyers only area. Ha! I AM A FLYER!!!! As well as the helmets. Well, in case you anyhow fly and hit the glass on the wind tunnel. Not likely to happen since the instructor will be inside with you while you're still a beginner...still...better to be safe. All you got to do is keep your arms crossed in front of you, and you let your body lean forward. The wind is so strong you will automatically start floating!!!!! Takes some skill here, but always remember: Don't panic, keep your arch maintained, your backside tucked in, and your hands steady. Having fun!!!! I could fly in my first attempt! YAY!!! Though the first flight was only 45 seconds...it didn't feel as short! I guess it was difficult to get a clear shot, but I have to say I am truly amazed that these instructors can stand, run around, jump in the wind tunnel, and take off as and when they please, and come back to ground again. Watch what happened on our Bloggers' Night! You really have to keep your posture proper or you will be thrown off-balance if you flail your arms around too much, or if your legs are not bent properly, or if you start trying to grab the instructor. Another one here~ One half of the pretty twins - Jayley!!! She's in this year's New Paper New Face yeah? Support hor! Flying's really safe, and it can accomodate EVERYBODY - young, old, ugly, handsome/pretty....I heard they've recently organized a birthday party for a bunch of really young kids! Like, cater the food, and then after the food and the birthday cake, off and into the wind tunnel to skydive! 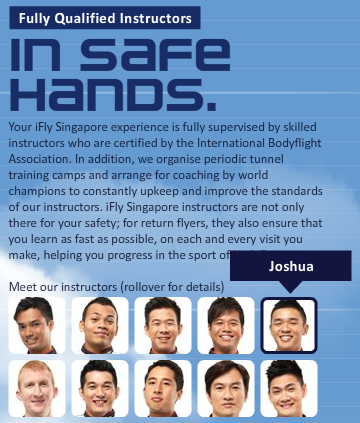 Anyway, want to find out if you qualify to fly at iFly Singapore? You weigh less than 120kg if you're shorter than 1.8m tall & less than 140kg if you exceed 1.8m. You have not previously dislocated your shoulder/back injuries nor sustained any of these injuries. How much do you think this will cost you? Usual price for 2 45-second sessions (like what we did) is S$89 for the Adult First-Timer Challenge Package. You can check out their rates at the iFly Singapore website. Just flash this blogpost (either on your tablet,iPad, laptop, smartphone, printout, however as long as you show this part) and you'll get to enjoy the package at $59. Offer is valid EVERY WEDNESDAY for the month of SEPTEMBER, for all flights. Remember to present the post upon purchase of flight tickets at the iFly Singapore Ticketing Counter for the offer! Online advance bookings do not apply. Each flight will take about 2.5 hours, including briefing, training, gearing up, and the actual flight. And do check in at least 1.5 hours before your flight. Like if you book your flight at 7:30pm (all schedules can be checked on the online booking page on their site), do arrive at 6:00pm or slightly earlier. It's in Sentosa, right next to Beach Station, between Siloso and Palawan Beach. Most of you may want to go in via VivoCity, and take the Sentosa Express to get into Sentosa. If you don't already know (where HAVE you been??? ), you can use your EZ-Link card to take the Sentosa Express to get into Sentosa, so you won't have to pay separate admission charges after that. It'll bring you right to Beach Station. For drivers, just drive towards Artillery Avenue, and turn into Beach View, towards the Beach Carpark. 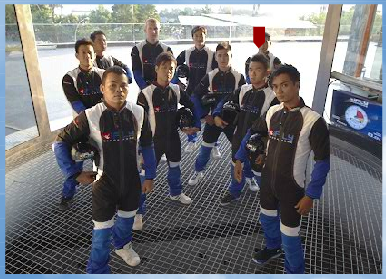 Go on, call a few friends, head to Sentosa, and go to iFly after school/work on Wednesdays, and have a laugh at each others' flying skills. Lol~ And just enjoy a first-time together. These days everyone seems to have tried everything, but this is kinda new, so it's great for bonding!